So you are tent-bound at 5,400m in Mt. Aconcagua. It snows but the wind has calmed down. How cold is it out there, you don`t know; the stove has warmed up the tent, and besides you and your tent-mate are buried in the lofty down of the sleeping bags (In this neighbourhood, goose beats dog as man’s best friend). You’ve already played cards, eaten and discussed the next days. Before you start missing a cell phone, here are some facts about the mountains around and above your tent, that (we hope) might spark some “tent talks”. Is this really the tallest mountain in the American continent? If we measure from sea level to summit, yes. According to the academic research project Sigma Program (2012), Mt. Aconcagua rises 6.960,8m above the surface of the ocean. This measurement is now the official altitude, accepted by the Argentinean Instituto Geográfico Nacional(IGN). Standing 770 meters above Mt. Denali in Alaska (6.190 m), Aconcagua is the highest mountain in the continent. And in the Western Hemisphere: the only highest mountains are all in Asia, in ranges like the Himalayas, Hindu Kush, Karakoram or Tien Shan (Celestial Mountains). But is our starting point wasn´t the level of the sea but its bottom, then the Hawaiian volcano Mauna Kea would be the highest mountain in the planet (more than 10.000 m from base to summit). Or, if we were to consider the center of the Earth as reference, then the Ecuadorian volcano Chimborazo would be the tallest peak in the Americas and the whole World (followed by the beautiful Huascarán). What about the big peaks visible form the higher camps? The huge, snow capped mountains to the North of Aconcagua are the Ramada range. Cerro Mercedario is the maximum elevation of this wild cordillera. 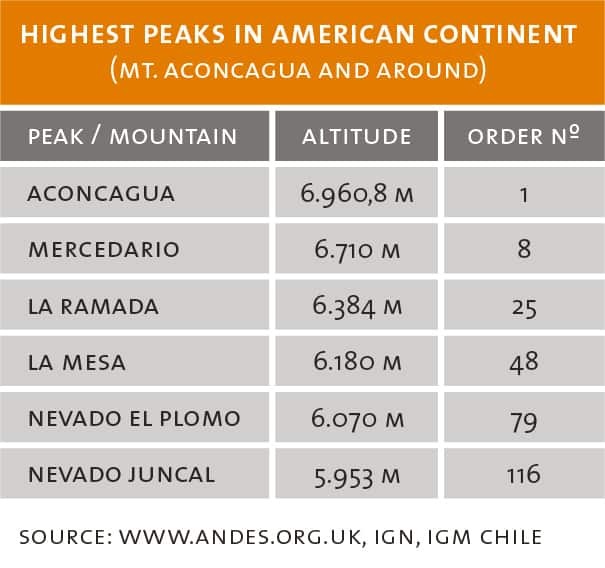 According to the authoritative “List of 6.000 m peaks of the Andes” published by the Scottish mountaineer and author John Biggar, Mercedario is the eighth highest mountain in the Andes (www.andes.org.uk). The official height of this massif is 6.770 m, but Biggar and other sources use 6.710 or 6.720 m.
The Ramada area was explored and first climbed in 1934 by the famous Polish team that pioneered the Polish Glacier in Aconcagua. With self-constructed (and tested) climbing gear, and without taking themselves too seriously, the group led by Konstanty Jodko-Narkiewicz completed an impressive raid of first ascents in the Central Andes. One of the climbers, Victor Ostrowski, wrote the classic mountaineering book “Más alto que los Cóndores” (Higher than the Condors), which, unfortunately, has not been translated to English. The cerros (mountains) in the Ramada range are: Mercedario, La Mesa and Ramada (the three more notorious peaks when looking at the massif form Aconcagua); Pico Polaco (the more technical) and Alma Negra (Black Soul). This peaks are accesible from the province of San Juan, North of Mendoza. There are normal routes similar to those of Aconcagua, but more isolated, and there are many technical challenges and unclimbed routes. The website Summitpost.org offers some good descriptions (https://www.summitpost.org/mercedario-group/171040). 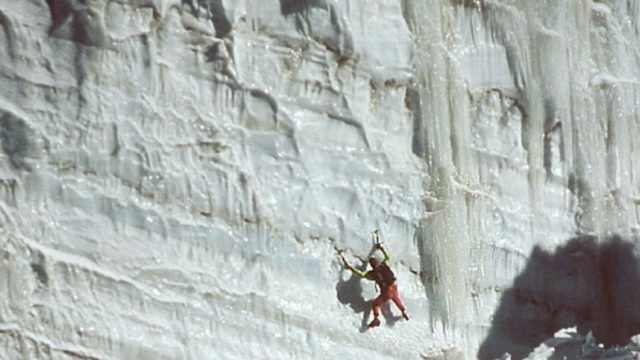 Two climbers traverse snow fields, close to the 6.070 m summit of Nevado del Plomo. 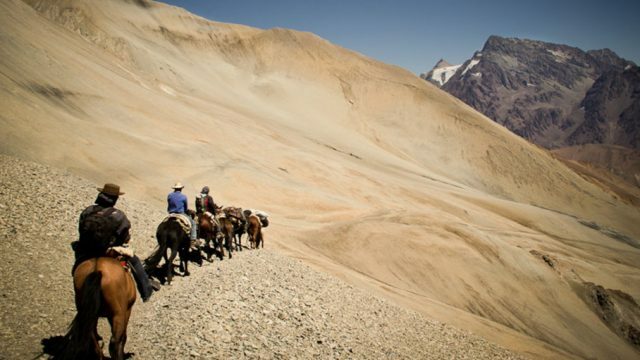 Few expeditions visit the Argentinean side of the Plomo-Juncal area. A few miles to the South of Aconcagua, the heavily glaciated peaks that stand out are the Nevado del Plomo and Nevado del Juncal. This seldom visited world of ice and stone guards breathtaking landscapes and some great climbing challenges. 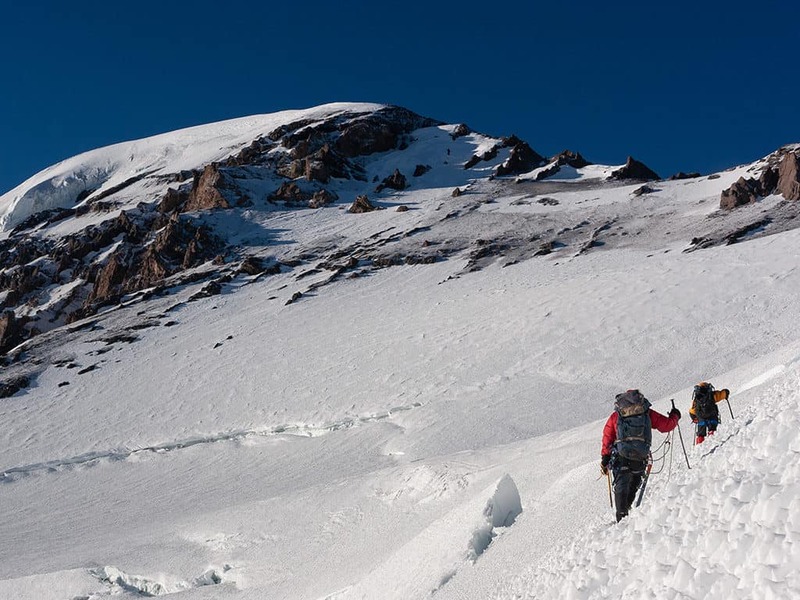 In spite of its significant stature (6.070 m), Nevado del Plomo had been climbed less than 15 times by 2006. Perhaps this obeys more to its remote location, with long and difficult approaches from both Argentina and Chile, than to its climbing difficulties. This is, setting apart the scary East face, an Aconcagua’s South Face-like beast of hanging glaciers and dark rock. Nevado Juncal, on the other hand, has a classic ice and glacier route, with an easier access from Chile, close to the international border. 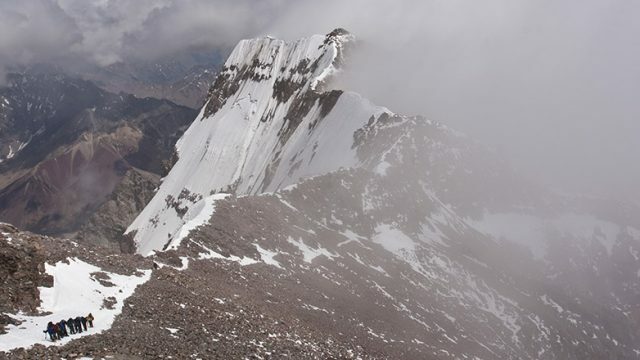 Both this peak of elegant lines and its neighbor Plomo were explored and climbed by the great “andinistas” Frederic Reichert and Robert Helbling, in 1910-11. Helbling, a cartographer born in Switzerland, later produced the first detailed topographical map of the area. It was so accurate that an aerial survey and mapping completed in the 1970’s showed almost no differences with Helbling’s work. 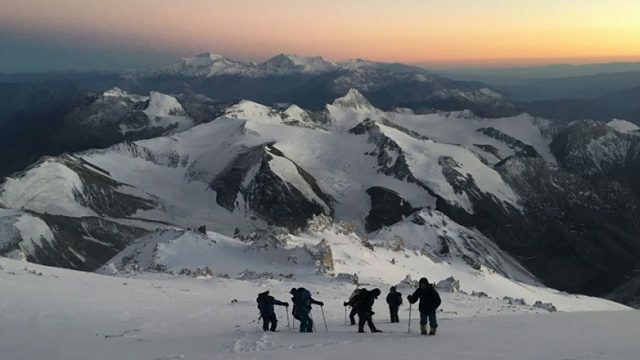 The pioneers, although, gave an altitude of 6.110 m to Juncal; nowadays, it is widely accepted that the peak’s altitude is between 5.953 m (Chilean official elevation) and 5.965 m (Argentinean IGN).